US immigration proposals: What's in the Raise Act? US President Donald Trump has backed proposals for changes to the country's immigration law. The changes in the Raise Act (the initials stand for Reforming American Immigration for Strong Employment) would attempt to reduce the number of legal immigrants by 50% over the next 10 years. The proposals are a long way off being made law. They are likely to face resistance in Congress from Democrats and some Republicans. Here is what is being proposed. This is the nickname commonly given to Permanent Residence Cards. They allow people over the age of 18 to live and work in the US and are currently given to more than a million people a year. Under the proposals this number would be cut; green cards would be given to just over 500,000 people a year. 140,000 employment-based green cards are issued a year. At the moment people from outside the US can apply in three categories, with a top priority given to foreign nationals who have "extraordinary ability" in fields including science and athletics, or who are multinational managers or "outstanding" researchers. This will change to a points-based system that considers factors including education levels, age and future salary, similar to the systems used in Canada and Australia. Media captionThe BBC's Jon Donnison explains how the points-based system works in Australia. Mr Trump said the system would prioritise English speakers, and those who can support themselves and their families financially and demonstrate skills that contribute to the US economy. 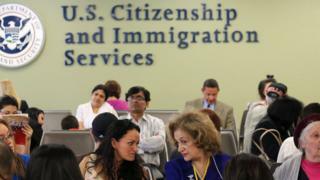 New holders of green cards would not be eligible for any means-tested federal benefits for five years after arriving. At present, people who have an extended family member living legally in the US are prioritised for green cards. If this set of proposals went through, that preference would be removed. The adult children of immigrants would not be prioritised anymore either. Preference would instead be given to spouses and children under the age of 18. One new measure would be created. If a US resident had a sick parent, that parent could be allowed to enter the US on a renewable five-year visa as long as the resident promised to be financially responsible for them. Millions of people a year apply to this green card lottery, and 50,000 are successful. The diversity immigrant visa programme was started more than two decades ago by order of Congress. It is a way to get in to the US without having the family links or employment prospects required for the other methods. Under these proposals, the programme would be completely scrapped. Former President Barack Obama pledged before leaving office that he would admit 110,000 refugees a year. The proposals would cut that number to 50,000. The draft law does not touch on seasonal visas for guest workers.